Pristine is the leading fungicide for controlling key diseases in apples, grapes, kiwifruit, onions, pears and stone fruit. Its two active ingredients provide very high levels of control, and Pristine also promotes a superior fruit finish with less risk of russeting in pipfruit. 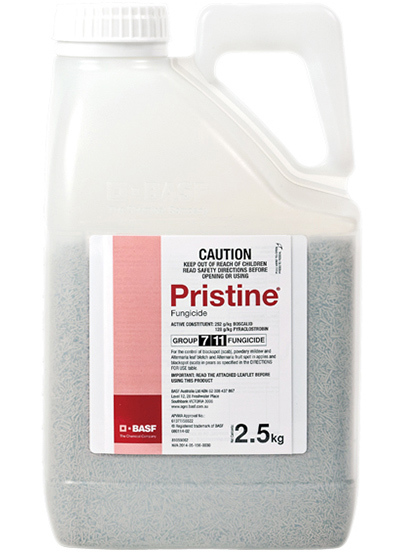 Pristine® is a combination of a Group 7 and a Group 11 fungicide. Its two modes of action combine to deliver rapid, high-performance disease control. The pyraclostrobin in Pristine inhibits spore germination, mycelial growth and sporulation of the fungus on the leaf surface. The boscalid component has a translocation mechanism that allows for optimum coverage throughout the leaf. It stops both energy production and synthesis of amino acids and lipids that are critical for fungal growth. The two active ingredients work at different sites of action to reinforce the dependability of Pristine’s disease control.